“ABC. ‘A’, always. ‘B’, be. ‘C’, closing. ALWAYS BE CLOSING. Always be closing.” -Glengarry Glen Ross. Or did you know that 50% of sales time is wasted on poor prospects? We all know that each prospect that visits a website is on a unique journey - having never heard of your brand or a repeat buyer. Whether the prospect downloaded one of your case studies, looked at the pricing page or chatted your customer service time, each action should inform your marketing department and sales force. Marketing has the ability to leverage this data and inform the sales force. Taking the data and creating an ongoing process to enable sales will give clarity on what you are spending and how that is affecting the bottom-line. Organizations utilizing sales enablement tools that track engagement have cut their sales cycles by 18%. So what is Sales Enablement? It’s a strategic and ongoing process that equips your sales and marketing employees to consistently have valuable conversations with the right type of consumer at the right stage of the sales process to optimize ROI. 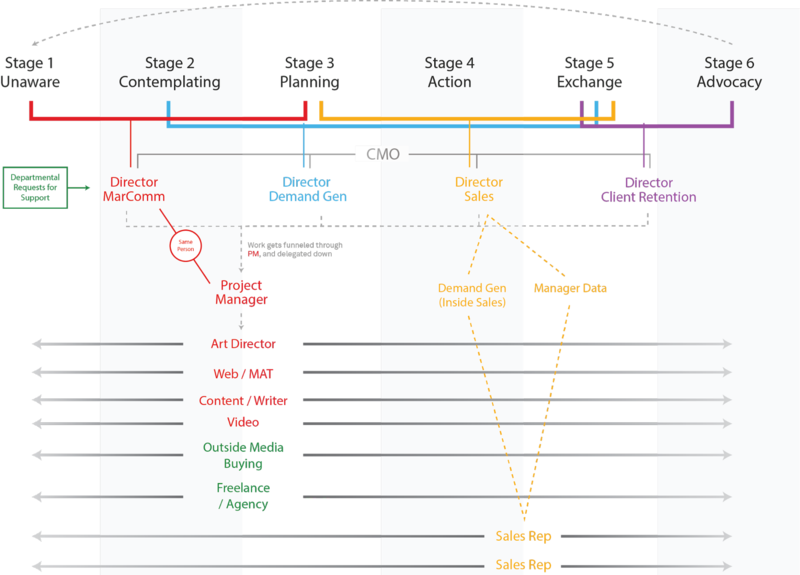 Here's an example of marketing & sales structured by the Consumer Decision Journey. This makes it very clear for each role which step of the journey they are responsible for. With our Cognitive Marketing model, we apply names to specific stages in the journey and provide processes that ultimately convert the prospect into a customer. For example, “Stage 2 – Contemplating” are different prospects than ones that are “Stage 4 – MQL”. It’s marketing’s job to create awareness, generate leads, and nurture leads until they are ready for sales to take over (MQL = Marketing Qualified Lead). What qualifies a prospect as an MQL is different at every organization, so it’s important for marketing and sales to set that criteria together. Once sales has taken the MQL, it’s vital for marketing to get feedback from sales on the quality of the lead. Did it close? If not, why? Feedback will information adjustments that can be made to the marketing plan to help provide better quality leads in the future. 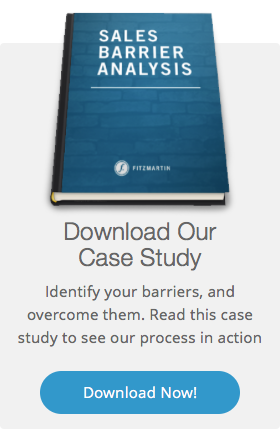 We have to become an expert on our client's internal sales process and objectives. For this to be truly effective, marketing must take ownership of the company goals. These goals should mirror sales goals. If your company needs an increase in product growth by 5%, then marketing needs to have a conversion rate goal that reflects the overarching company goal. These are easily spoken but hardly executed. We see it all the time.